There are a number of proposals when it comes to the land use of Spratly Islands. I started floating my own stake in my personal estimation or through the subjective prism of that science of which I am familiar with—correctional administration. In my view, the Spratly Islands may be transformed into a correctional reservation and a penal settlement for released prisoners. As it were, government tried to occupy the islands using it as military station if only to provoke other neighboring countries. In turn, these foreign forces would also snipe back at the nearby area suspecting that some kind of a military incursion may intrude into their boundaries. Worst, they would even parade their advanced military hardware putting into shame our fledging soldierly station. My proposal is a subdued one although not limited to it. An activity, which is not provocative, is therefore in order. Other government agencies may also submit some creative proposals. 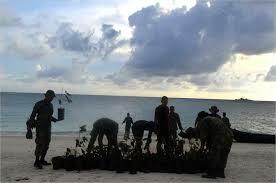 DENR for instance may propose that the islands be made into a national park for exotic flora and fauna. DEPED may also use it as a biological laboratory for plants and other marine life. DOT may submit that the place be organized into a tourism site. So on and so forth. My proposal as penal settlement is just one idea if patriotic thinkers in government may wish to explore further. It is only wishful thinking on my part. It is just a simple effort to help government extricate itself from the fix it found itself. What becomes of my proposal however turned into a template for misinterpretation. My idea attracted more controversy from within government. It is as if thinking or helping government to reflect is the new definition of what rebellion is all about. My initiative is viewed as challenging the neighboring countries in Asia as if my position is the final straw which government must have to undertake. It is as if my effort in pursuing a proposal is anti-government and therefore deserving of censure. I remember one anecdote I heard from two military officials who were proud of their military station in Spratly Islands. According to them, when their soldiers saw a number of war fleets moving towards their direction, they immediately pulled down some bamboo poles, painted it with metallic blue and set it up as if it were some anti-aircraft cannons of sort. The warships, according to the report they received, withdrew with their tail behind. Of course, this is more apocryphal than real. What if the foreign military fleets engage the soldiers to a firefight? Our men would have been bar-b-cued on the spot! We oftentimes think of solution in terms of martial response. We fill up government posts from the ranks of those who retired from the uniformed service believing that their training in boot camp would make science of warfare a sterling quality in public service. Hence, civil service is undertaken with military science as foundation. Whether we are dealing with disaster, foreign service, social work or even legislation, we always have a military orientation in mind. Whether it is the disputed islands of Spratly, or some ancestral areas in Mindanao or remote barrios up North, instead of sending groups to conduct a study, we send troops to pacify conflict. Armed might therefore is answered by armed confrontation. Interested and affected parties indulge in war in what could have been a simple social negotiation effort. As a consequence, we have the longest insurgency in Asia, a growing discontent among masses, an inspired group seeking separation from the country and a hotbed for radicalism bordering on that field where some portions of our land becomes a training ground also for terrorism. We oftentimes use anger as a means to achieve forcefully what could have been conducted in a reasonable peaceful manner. We try to project ourselves like Westerners, they who look up to warriors as the ultimate player, when in fact we are Orientals who are more at ease with mysticism and patience. Now, going back to Spratly, it is still prudent to use it not in the martial sense. There are other scientific ways to make use of it than as basis for war mongering. Posted on June 18, 2013, in Uncategorized and tagged foreign service, government resolve, Military science, Spratly Islands. Bookmark the permalink. Leave a comment.